United States Courthouse, 350 West First Street, Los Angeles, CA. 90012. Courtroom location to be noticed. First Street Courthouse, 350 w. 1st Street, Los Angeles, CA. 90012 - Courtroom 5D, 5th Floor. 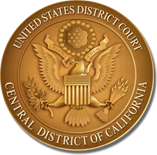 For information regarding INACTIVE/RETIRED U.S. District Judges, please click here.